From a vantage point on wooded Mt Genji overlooking the ancient city of Kamakura, Yoshihiro Takishita relaxes in his stately antique home after returning from a U.S. book tour. 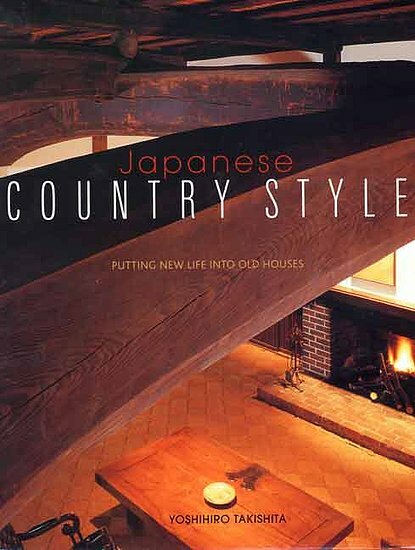 His book, Japanese Country Style: Putting New Life Into Old Houses is the culmination of his career to date as a rescuer and restorer of old Japanese minka (farmhouses). His life’s work has been to preserve the grace and style of traditional Japanese architecture for future generations to appreciate, enjoy and admire. The positive response of audiences on his U.S. tour “gave me confidence in what I’m doing, that I’m doing the right thing––and that’s so important for Japanese people, he said. The book is essentially a collection of excellent architectural photographs that capture the splendour of 16 of the minka homes Takishita has rejuvenated. But it also includes insight into his life and his passion for minka, background information on the buildings, tips for modernising the homes, hints on joinery, advice on suitable interior decorating and details on dismantling, transporting, and reassembling the structures in separate locations. Takishita has saved 30 such homes so far, dismantling the buildings, transporting the materials to new locations and reconstructing them to live on as examples of a bygone age when elegance, refinement and grandeur were more highly regarded than purely economic considerations and rationalisation. “Government statistics show that the average lifespan of a new house in Japan is 26 years. People say ‘economy comes first,’ but what kind of economy is it when a house only lasts 26 years? In the long term, minka are much more economical,” Takishita said. 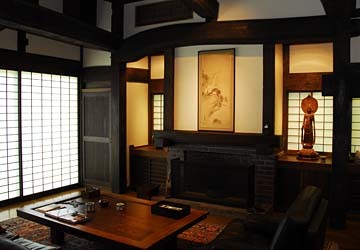 To sit chatting with Takishita in the spacious living area of the more than 200-year-old minka annex to his Kamakura home, surrounded by sturdy, solid wooden uprights and majestic overhead beams blackened by centuries of wood smoke and the patina of age, is truly awe-inspiring. He uses the building as a showroom for his separate, but complementary, business as an antique dealer. “What could be better than to display antiques in than an antique building?” he asks in his book. Takishita fears the nation is losing its way culturally and is allowing the West too great an influence. “We are losing our sense of beauty and sense of value. We are losing the beautiful things in this country. We are ruining and destroying it.” He said. “Japanese are group-minded and community-minded; they lack the ability to make individual judgement––it’s a shame, Takishita said. “Losing (World War II) was a denial of our cultural heritage and we lost confidence in our traditions. It is now time for us to rediscover Japan and it is my mission to spread this message,” he said. There seems to be a popular misconception among Japanese that old houses are cold, dark, dirty, damp, uncomfortable and expensive to maintain. Worse, they carry the stigma of penury in the Japanese mind-set, in which keeping up with the Watanabes is essential. “For Japanese, to live in a farmhouse is a symbol of poverty. A thatched-roof house is considered shameful,” Takishita said. This may have been valid 100 years ago, but Takishita’s homes have every modern convenience from flush toilets to Jacuzzis, as each home can be tastefully modified to include any amenity required in the process of disassembly and reconstruction. Incorporating fireplaces, air conditioning, and subfloor heating panels that warm the entire home from the bottom up solve the heating problem, skylights improve lighting and security is enhanced with locking doors and windows. Takishita appears to have a solution for every objection and a visit to his comfortable Kamakura home quickly dispels minka misconceptions. Takishita looks to the past for a vision of the future and his excellent book redefines the word “progress.” Modern buildings become inconsequential, regressive and artless beside the splendour of minkas, serving as a reminder to us all that we can still learn from our ancestors. This entry was posted in Architecture, Art, Book Review, Economics, Education, Environment, Historical, Japan, Photography, Product review, Social Commentary, Sustainablity and tagged Architecture, Art, Cominka, Culture, Davina Pardo, Heritage, History, Japan, Minka, Natural Building, Paul Murray, Takishita, Tradition, Yohihiro Takishita. Bookmark the permalink. Someday sooner rather than later I would like to meet Mr Takishita and perhaps find time to visit each other’s homes. I’m sure he’ll be a fascinating person to meet. Thanks as always Paul. 40 years in that house. Wow – much must’ve changed. I love how Yoshihiro’s uses all of his senses tp enjoy life and how he so honors the life in these Minkas…I too have lived in my home for almost 40 years and because there is nature all around me I too feel secure.I would like very much to meet him as I feel we would laugh and just enjoy the moment….I am an artist….I photograph and paint and farm my land. Victoria I was so very touched in my heart by the film…that I had to speak of it. Thanks for taking the time to comment Vicki, Takishita san is indeed a special person, a lovely man, I have been fortunate enough to meet him and he is an inspiration to me and many others. I am traveling to Japan in October and will catch up with him again then…I will pass on your kind words. Thanks again, Paul.